Law—it is a serious aspect of society, but the students at Orange Lutheran bring life to and find amusement within the stoic courtroom. 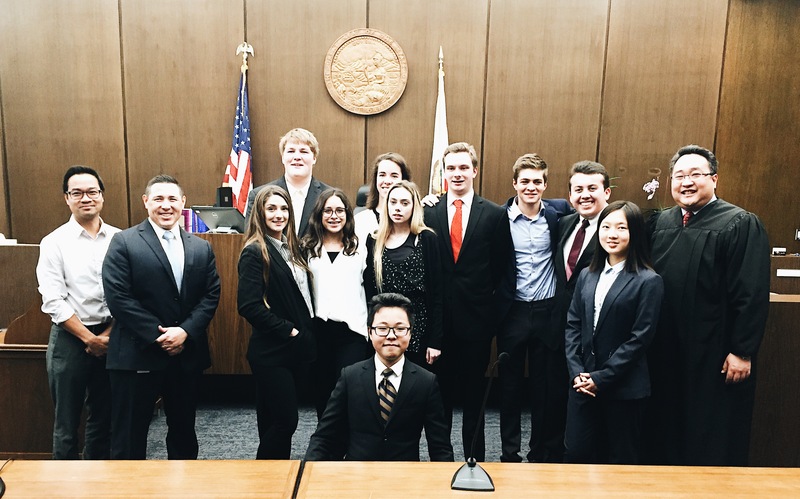 Meet Orange Lutheran’s Mock Trial Team, a group of high-energy students who have grown to thrive in front of a jury. Mock Trial is a program run through the Constitutional Rights Foundation intended to teach students about the judicial system while enhancing their communication and analytical skills. It highlights the obligations and responsibilities students hold as active members of society. Each year, teams throughout the state are given a case packet. This daunting set of information holds everything they need to know about their trial for the season; it comes loaded with the facts of the case, laws that pertain to the case, and information on the outcomes of similar cases. Team attorney Salim Elsayegh, senior, said, Mock Trial “is exactly like Law and Order.” Students are divided into the defense and prosecution, where they are then given the roles of either attorney, witness, pretrial attorney, bailiff, or clerk. The attorney’s task: sift through the case, which is fake but based off of real events, and create an argument as to why their client is innocent, or the opposing client is guilty. Here’s the catch, however. The attorney cannot solely focus on the facts that help their side, but they must also memorize the information that is harmful to their client in order to devise possible rebuttals. The witness’s task: memorize the facts about the character they are playing and turn on those acting skills. Witnesses play the role of a person who is in some way involved in the case. When they are on the stand, they must be ready to answer any question the opposing attorney throws at them based off of the facts of the case packet; this is where quick-thinking skills come in handy. Elsayegh explained one fateful occurrence during a trial last season: “I forgot the name of the high school that my witness went to and the college, so I made up a school and I randomly said Acorn High, which was actually the name of the high school.” It is moments like these when critical thinking skills are the team’s best friend. The pretrial attorney’s task: prove to the judge that the facts they are using as evidence in the trial are reliable and legally viable. Yushuo Ding, senior, played the role of pretrial attorney last season and said, “What I did last year dealt with proving that GPS tracking information should be used as evidence, although it is a violation of the user’s privacy.” Ding had to pull together an elaborate and well-researched presentation in hopes of convincing the judge to consider the faulty evidence. She succeeded. Although the team is relatively serious about the learning process, the meetings and competitions are always a good time. Most of the team members say that they love Mock Trial most for the sense of team spirit and community that is naturally built throughout the process. At many meetings, they are greeted by the smell of fresh pizza and their teammates’ smiling faces. A memory the team will forever savor is the team dinners they attend after trials. Amped up on adrenaline from being under the pressure of a judge and jury, the members say that the team dinners are full of laughs and fun.